Ur (/ʊər/; Sumerian: Urim; Sumerian Cuneiform: 𒋀𒀕𒆠 URIM2KI or 𒋀𒀊𒆠 URIM5KI; Akkadian: Uru; Arabic: أور‎; Hebrew: אור‎) was an important Sumerian city-state in ancient Mesopotamia, located at the site of modern Tell el-Muqayyar (Arabic: تل المقير‎) in south Iraq's Dhi Qar Governorate. 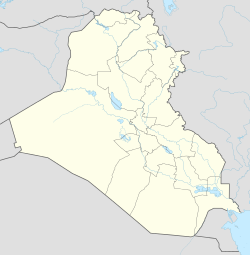 Although Ur was once a coastal city near the mouth of the Euphrates on the Persian Gulf, the coastline has shifted and the city is now well inland, on the south bank of the Euphrates, 16 kilometres (9.9 miles) from Nasiriyah in modern-day Iraq. The site is marked by the partially restored ruins of the Ziggurat of Ur, which contained the shrine of Nanna, excavated in the 1930s. 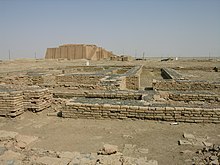 The temple was built in the 21st century BC (short chronology), during the reign of Ur-Nammu and was reconstructed in the 6th century BC by Nabonidus, the last king of Babylon. The ruins cover an area of 1,200 metres (3,900 ft) northwest to southeast by 800 metres (2,600 ft) northeast to southwest and rise up to about 20 metres (66 ft) above the present plain level. Ur was surrounded by sloping ramparts 8 metres high and about 25 metres wide, bordered in some places by a brick wall. Elsewhere, buildings were integrated into the ramparts. The Euphrates river complemented these fortifications on the city's western side. The name 𒋀𒀊𒆠 for "Country of Ur" on a seal of King Ur-Nammu. It is thought that Ur had a stratified social system including slaves (captured foreigners), farmers, artisans, doctors, scribes, and priests. High-ranking priests apparently enjoyed great luxury and lived in mansions. Excavation in the old city of Ur in 1929 revealed lyres, instruments similar to the modern harp but in the shape of a bull and with eleven strings. When Ur was founded, the Persian Gulf's water level was two-and-a-half metres higher than it is today. Ur is therefore thought to have had marshy surroundings, and used canals only for transportation, not for irrigation. Fish, birds, tubers, and reeds might have supported Ur economically without the need for an agricultural revolution sometimes hypothesized as a prerequisite to urbanization. Archaeologists have discovered the evidence of an early occupation at Ur during the Ubaid period (ca. 6500 to 3800 BC). These early levels were sealed off with a sterile deposit of soil that was interpreted by excavators of the 1920s as evidence for the Great Flood of the Book of Genesis and Epic of Gilgamesh. It is now understood that the South Mesopotamian plain was exposed to regular floods from the Euphrates and the Tigris rivers, with heavy erosion from water and wind, which may have given rise to the Mesopotamian and derivative Biblical Great Flood stories. The further occupation of Ur only becomes clear during its emergence in the third millennium BC (although it must already have been a growing urban center during the fourth millennium). As other Sumerians, the new settlers of Ur were a non-Semitic people who may have come from the east circa 3300 BCE, and spoke a language isolate. But during the 3rd millennium BC, a close cultural symbiosis developed between the Sumerians and the East-Semitic Akkadians, which gave rise to widespread bilingualism. The reciprocal influence of the Sumerian language and the Akkadian language is evident in all areas, from lexical borrowing on a massive scale, to syntactic, morphological, and phonological convergence. This has prompted scholars to refer to Sumerian and Akkadian in the 3rd millennium BC as a Sprachbund. The third millennium BC is generally described as the Early Bronze Age of Mesopotamia, which ends approximately after the demise of the Third Dynasty of Ur in the 21st century BC. Gold helmet of King of Ur I Meskalamdug, circa 2600–2500 BCE. The Standard of Ur mosaic, from the royal tombs of Ur, is made of red limestone, bitumen, lapis lazuli, and shell. The "peace" side shows comfort, music, and prosperity.The "war" side of the Standard of Ur shows the king, his armies, and chariots trampling on enemies. There are various main sources informing scholars about the importance of Ur during the Early Bronze Age. The First Dynasty of Ur seems to have had great wealth and power, as shown by the lavish remains of the Royal Cemetery at Ur. The Sumerian King List provides a tentative political history of ancient Sumer and mentions, among others, several rulers of Ur. 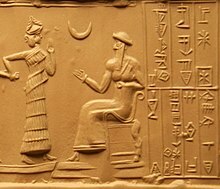 Mesannepada is the first king mentioned in the Sumerian King List, and appears to have lived in the 26th century BC. That Ur was an important urban centre already then seems to be indicated by a type of cylinder seal called the City Seals. These seals contain a set of proto-cuneiform signs which appear to be writings or symbols of the name of city-states in ancient Mesopotamia. Many of these seals have been found in Ur, and the name of Ur is prominent on them. A large body of cuneiform documents, mostly from the empire of the so-called Third Dynasty of Ur (also known as the Neo-Sumerian Empire), appears at the very end of the third millennium. This was the most centralized bureaucratic state the world had yet known. Enthroned King Ur-Nammu (ca. 2047–2030 BC). "Abraham's House" in Ur, photographed in 2016. Ur is mentioned four times in the Torah or Old Testament, with the distinction "of the Kasdim/Kasdin"—traditionally rendered in English as "Ur of the Chaldees". The Chaldeans had settled in the vicinity by around 850 BC, but were not extant anywhere in Mesopotamia during the 2nd millennium BC period when Abraham is traditionally held to have lived. The Chaldean dynasty did not rule Babylonia (and thus become the rulers of Ur) until the late 7th century BC, and held power only until the mid 6th century BC. The name is found in Genesis 11:28, Genesis 11:31, and Genesis 15:7. In Nehemiah 9:7, a single passage mentioning Ur is a paraphrase of Genesis. In the four corners of the ziggurat's top stage, Taylor found clay cylinders bearing an inscription of Nabonidus (Nabuna`id), the last king of Babylon (539 BC), closing with a prayer for his son Belshar-uzur (Bel-ŝarra-Uzur), the Belshazzar of the Book of Daniel. Evidence was found of prior restorations of the ziggurat by Ishme-Dagan of Isin and Shu-Sin of Ur, and by Kurigalzu, a Kassite king of Babylon in the 14th century BC. Nebuchadnezzar also claims to have rebuilt the temple. Aerial photograph of Ur in 1927. Excavations from 1922 to 1934 were funded by the British Museum and the University of Pennsylvania and led by the archaeologist Sir Charles Leonard Woolley. A total of about 1,850 burials were uncovered, including 16 that were described as "royal tombs" containing many valuable artifacts, including the Standard of Ur. Most of the royal tombs were dated to about 2600 BC. The finds included the unlooted tomb of a queen thought to be Queen Puabi—the name is known from a cylinder seal found in the tomb, although there were two other different and unnamed seals found in the tomb. Many other people had been buried with her, in a form of human sacrifice. Near the ziggurat were uncovered the temple E-nun-mah and buildings E-dub-lal-mah (built for a king), E-gi-par (residence of the high priestess) and E-hur-sag (a temple building). Outside the temple area, many houses used in everyday life were found. Excavations were also made below the royal tombs layer: a 3.5-metre-thick (11 ft) layer of alluvial clay covered the remains of earlier habitation, including pottery from the Ubaid period, the first stage of settlement in southern Mesopotamia. Woolley later wrote many articles and books about the discoveries. One of Woolley's assistants on the site was the archaeologist Max Mallowan. The discoveries at the site reached the headlines in mainstream media in the world with the discoveries of the Royal Tombs. As a result, the ruins of the ancient city attracted many visitors. One of these visitors was the already famous Agatha Christie, who as a result of this visit ended up marrying Max Mallowan. During this time the site was accessible from the Baghdad–Basra railway, from a stop called "Ur Junction". When the Royal Tombs at Ur were first discovered, they had no idea how big they were. They started by digging two trenches in the middle of the desert to see if they could find anything that would allow them to keep digging. They originally split into two teams. Team A and team B. Both teams spent the first few months digging a trench and had found evidence of burial grounds by collecting small pieces of golden jewelry and pottery. This was called at the time the "gold trench" At this time, the first season of digging had come to a close, and Woolley returned to England. In Autumn, Woolley returned and continued to dig into the second season. By the end of the second season, he had uncovered a courtyard surrounded by many rooms. In their third season of digging they had uncovered their biggest find yet, a building that was believed to have been built by the orders of the king, and the second building to be where the high priestess lived. As the fourth and fifth season came to a close, they had discovered so many items, that most of their time was now spent recording the objects they found instead of actually digging objects. They had found many items from gold jewelry to clay pots and stones. There were a few Lyres that were inside of the tombs as well. One of the most significant objects that was discovered was the Standard of Ur. At the end of their sixth season they had excavated 1850 burials and deemed 17 of them to be "Royal Tombs". Woolley had finished his work excavating the Royal Tombs of UR in 1934. Inside princess Puabi's tomb, there was a chest in the middle of the room. Underneath that chest was a hole in the ground that led to what was called the "King's grave" PG-789. It was believed to be the kings grave because it was buried next to the queen. In the "King's Grave" were 63 attendants who were all equipped with copper helmets and swords. It is thought to be his army buried with him. Another large room was uncovered, PG-1237, called the "Great death pit". This large room had 74 bodies, 68 of which were women. There were only two artifacts in the tomb, both of which were Lyres. U.S. soldiers ascend the reconstructed Ziggurat of Ur in May 2010. Since 2012, a joint team of Italian and Iraqi archaeologists led by Franco D'Agostino have been excavating at Tal Abu Tbeirah, located 15 kilometers east of Ur and 7 kilometers south of Nasariyah. The site, about 45 hectares in area, appears to have been a harbor and trading center associated with Ur in the later half of the 3rd Millenium BC. ^ S. N. Kramer (1963). The Sumerians, Their History, Culture, and Character. University of Chicago Press, pages 28 and 298. ^ The Cambridge Ancient History: Prolegomena & Prehistory. Vol. 1, Part 1. p. 149. Accessed 15 Dec 2010. ^ Tell el-Muqayyar in Arabic Tell means "mound" or "hill" and Muqayyar means "built of bitumen." Muqayyar is variously transcribed as Mugheir, Mughair, Moghair, etc. ^ a b Erich Ebeling, Bruno Meissner, Dietz Otto Edzard (1997). Meek – Mythologie. Reallexikon der Assyriologie. (in German) p. 360 (of 589 pages). ISBN 978-3-11-014809-1. ^ Aruz, J. [ed.] (2003). Art of the First Cities. The Third Millennium B.C. from the Mediterranean to the Indus, The Metropolitan Museum of Art, New York. ^ Klimczak, Natalia. "Bask in the Beauty and Melody of the Ancient Mesopotamian Lyres of Ur". Ancient Origins. Retrieved 2018-01-13. ^ Crawford 2015, p. 5. ^ Bromiley, Geoffrey W. (1979). The International Standard Bible Encyclopedia. Wm. B. Eerdmans Publishing. p. 392. ISBN 9780802837813. ^ Matthews, R.J. (1993). Cities, Seals and Writing: Archaic Seal Impressions from Jemdet Nasr and Ur, Berlin. ^ Amélie Kuhrt (1995). The Ancient Near East: C.3000-330 B.C. Routledge. ISBN 0-415-16762-0. ^ Potts, D. T. (1999). The Archaeology of Elam. Cambridge, United Kingdom: Cambridge University Press. p. 132. ISBN 0-521-56496-4. Retrieved 16 May 2015. ^ Dahl, Jacob Lebovitch (2003). The ruling family of Ur III Umma. A Prosopographical Analysis of an Elite Family in Southern Iraq 4000 Years ago (PDF). UCLA dissertation. Archived from the original (PDF) on 2006-05-12. ^ "What Were the Largest Cities Throughout History?". Geography.about.com. Retrieved 11 August 2017. ^ Salaheddin, Sinan (April 4, 2013). "Home of Abraham, Ur, unearthed by archaeologists in Iraq". The Christian Science Monitor. Retrieved July 15, 2017. ^ McLerran, Dan (June 23, 2011). "Birthplace of Abraham Gets a New Lease on Life". Popular Archaeology. 3. Retrieved July 15, 2017. ^ "Journey of Faith". National Geographic Magazine. May 15, 2012. Retrieved July 15, 2017. ^ "Book of Jubilees: The Book of Jubilees: The History of the Patriarchs from Reu to Abraham; the Corruption of the Human Race (xi. 1–15)". Sacred-texts.com. Retrieved 11 August 2017. ^ Crawford 2015, p. 3. ^ J.E. Taylor, "Notes on the Ruins of Muqeyer", Journal of the Royal Asiatic Society of Great Britain and Ireland, vol. 15, pp. 260–276, 1855. ^ JE Taylor, "Notes on Abu Shahrein and Tel-el-Lahm", Journal of the Royal Asiatic Society of Great Britain and Ireland, vol. 15, pp. 404–415, 1855. [In the relevant publications he is erroneously listed as J. E. Taylor]. ^ E. Sollberger, "Mr. Taylor in Chaldaea", Anatolian Studies, vol. 22, pp. 129–139, 1972. ^ a b Crawford 2015, p. 4. ^ a b Leonard Woolley, Excavations at Ur: A Record of Twelve Years' Work, Apollo, 1965, ISBN 0-8152-0110-9. ^ H. R. Hall, "The Excavations of 1919 at Ur, el-'Obeid, and Eridu, and the History of Early Babylonia", Man, Royal Anthropological Institute of Great Britain and Ireland, Vol. 25, pp. 1–7, 1925. ^ H. R. Hall, "Ur and Eridu: The British Museum Excavations of 1919", Journal of Egyptian Archaeology, vol. 9, no. 3/4, pp. 177–195, 1923. ^ Leonard Woolley, Ur: The First Phases, Penguin, 1946. ^ Leonard Woolley and P. R. S. Moorey, Ur of the Chaldees: A Revised and Updated Edition of Sir Leonard Woolley's Excavations at Ur, Cornell University Press, 1982, ISBN 0-8014-1518-7. ^ Queen Puabi is also written Pu-Abi and formerly transcribed as Shub-ab. ^ Crawford 2015. p. 5. "It used to be close to the Basra to Baghdad railway, part of the proposed Berlin to Basra line that was never completed. It was possible to get off the train from Baghdad at the grandly named Ur Junction, where a branch line turned off to Nasariyah, and drive a mere two miles across the desert to the site itself, but the station was closed sometime after the Second World War, leaving a long, hot journey in a four-wheeled vehicle as the only option." ^ "The Royal Tombs of Ur – Story". Mesopotamia.co.uk. Retrieved 2016-12-04. ^ "Iraq's Ancient Past: Rediscovering Ur's Royal Cemetery". Penn.museum. Retrieved 11 August 2017. ^ "Soldiers visit historical ruins of Ur", Nov 18, 2009, by 13th Sustainment Command Expeditionary Public Affairs, web: Army-595. ^ "US returns Ur, birthplace of Abraham, to Iraq". AFP. 2009-05-14. Retrieved 2009-09-12. Chisholm, Hugh, ed. (1911). "Ur". Encyclopædia Britannica. 27 (11th ed.). Cambridge University Press. pp. 783–784. C.J. Gadd. History and monuments of Ur, Chatto & Windus, 1929 (Dutton 1980 reprint: ISBN 0-405-08545-1). P. R.S. Morrey. "Where Did They Bury the Kings of the IIIrd Dynasty of Ur? ", Iraq, vol. 46, no. 1, pp. 1–18, 1984. J. Oates, "Ur and Eridu: The Prehistory", Iraq, vol. 22, pp. 32–50, 1960.